11", 1.0", 15 Spline, Fiber, Rigid Clutch Disc - New for John Deere 1020 2630 2640 2020 2030 2440 1520 Tractor and 135, 4276D, 180, 180, 202, 219D, 219T, 202, 219, 219, 164, 164, 135, 152, 152, 164, 164. 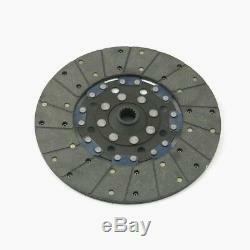 The item "Clutch Disc New for John Deere, 1020 2630 2640 2020 2030 2440 1520 Tractor" is in sale since Thursday, December 13, 2018. This item is in the category "Business & Industrial\Heavy Equipment, Parts & Attachments\Heavy Equipment Parts & Accessories\Antique & Vintage Equipment Parts". The seller is "justauctions" and is located in Sparta, Michigan.